Hampton University requires a thesis from master's candidates pursuing the Plan A option and a dissertation from all candidates for the Doctor of Philosophy (PhD) degree. The requirements for format and quality are the same for theses and dissertations, despite their individual differences. The Graduate College has the responsibility to ensure the quality and proper formatting for publication of all theses and dissertations written by our students. For proper formatting, please refer to the most recent edition of the American Psycholgocal Associaion (APA) publication manual as it relates to a thesis or dissertation. In the event that a student needs assistance in securing editorial assistance, the Graduate College has a listing of approved editiors. This listing will be provided upon request, please email hugrad@hamptonu.edu. Each Student must be enrolled/an active student to submit a thesis or dissertation. Students are encouraged to acquire editorial support early in the thesis/dissertation process. To aid students the Graduate College has compiled a listing of University Approved Editors. Students may contact the Graduate College at hugrad@hamptonu.edu to obtain this list. Publishing the thesis/dissertation is a University requirement, satisfied by shelving in the University Library and submission to ProQuest. In cases where a paper is in press or a patent application is pending, the student may request a one-year delay in the dissemination of the manuscript by ProQuest and the public release of it through its availability in the University Library. All copies of the thesis/dissertation must be single-sided. Additionally, copies must be submitted on good quality, white bond paper of at least 20 lb, 25% cotton, and 8.5" x 11" in size. The paper selected must be used throughout each copy of the manuscript. Acid free paper is preferred to preserve the quality of the manuscript. The Request for the Appointment of the Advisory Committee form should be filed by the student prior to becoming a candidate for the degree (candidacy). Each member of the committee must sign the form and have curriculum vitae on file with the Graduate College. Once the Graduate College approves the advisory committee, notice will be sent by mail to the committee members and Program Coordinator. The Graduate College keeps a copy of the vitas of approved committee members on file. The student should request a current vita from new faculty members or faculty members outside of Hampton University who serve on a advisory committee to be submitted with the Request for the Appointment of the Advisory Committee form. If any changes to the committee are made after the form is submitted to the Graduate College. The student must submit a new form complete with the signatures of all the committee members. The Thesis Manual provides further guidance regarding the role and appointment of the advisory committee. 2. Apply for Admission to Candidacy and Graduation. At least six months (but no more than a year) prior to your expected graduation date, complete and submit the Application for Admission to Candidacy for Degree Completion form (specific to your program). This form serves as an application for candidacy, and as an application for graduation. Only students who: have met all admission requirements, have a cumulative GPA of 3.0 or higher, have passed the Qualifying Examination (doctoral candidates only), and do not have any incomplete course work (with the exception of research courses) are eligible to apply. Note: Other departmental requirements may affect eligibility for candidacy, please check with your advisor. If you do not graduate during the expected term, complete and submit a Graduation Update form according to published deadlines. You must have a current graduation application on file and be enrolled in order to graduate. Refer to the Important Dates for Graduate Students for this and other deadlines. 3. Electronic Submission of Thesis or Dissertation for Graduate College Review. Each student must submit an electronic copy of their thesis or dissertation via e-mail to the Graduate College counselor prior to the student's oral defense. The student must plan accordingly to have their thesis or dissertation submitted to the Graduate College in order to schedule their defense within the deadline. 4. Successfully complete an oral presentation and defense. Your Request to Conduct the Oral Thesis/Dissertation Defense must be approved by the Graduate College. The form should be submitted at least two weeks before the scheduled date of the defense. Numerous drafts should have been reviewed by the committee resulting in a final manuscript before the defense. The student has seven days to submit the final copies of the manuscript to Graduate College after a successful defense- allowing time for minor changes to be made to the manuscript before the deadline. 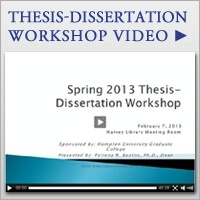 The Thesis Manual provides further guidance regarding the oral thesis/dissertation defense. When possible, the Dean or a representative from the Graduate College will attend the defense. 5. Submit one copy of the final manuscript to the Graduate College for review on regular paper along with the Thesis/Dissertation Transmittal form. The Graduate College will not review the student’s thesis or dissertation without the respective signatures on the Transmittal Form. One copy of the manuscript in final form must be submitted to the Graduate College by 5:00pm seven days after a successful defense (i.e. if you defend on the Tuesday, your final copies are due to the Graduate college the following Tuesday). The Thesis/Dissertation Transmittal form is to be submitted to the Graduate College before a compliance review of the manuscript can begin. The Graduate College reserves the right to reject a manuscript that is submitted after the deadline - this is likely to delay the student’s graduation date and will require an update of the thesis/dissertation. Refer to the Thesis Manual for detailed information regarding the submission of your thesis/dissertation. If corrections are required by Graduate College, students should note that the thesis/dissertation will only be accepted once for re-submission. Once the manuscript has been approved by the Graduate College, at least three copies must be oredred to be bound for the following academic areas, School of Nursing, Department of Chemistry, and the Department of Education. At least two copies must be ordered to be bound for all other academic disciplines. 6. Publish your manuscript or abstract. Currently, you are not required to publish your thesis/dissertation; however it is strongly encouraged by the Graduate College. Please talk with your committee chair or Program Coordinator regarding issues related to publishing your manuscript. The Graduate College and your Program Coordinator have publishing agreements available for the one of the oldest and most established publishing companies, University Microfilms (UMI) also known as ProQuest. These forms and more information can also be found on the UMI website. 7. Update your address with the Graduate College. Copies of approved manuscripts will be sent for binding in December, and then distributed to students, departments, and the library in March. The student’s bound copy will be sent the address indicated at submission (see Thesis Manual)- Please inform the Graduate College of any address changes between the time of submission and distribution of your manuscript. An electronic copy of the student's thesis or dissertation must be emailed to the Graduate College advisor prior to oral defense date (within 1-2 weeks) for review & approval to move forward with oral defense.